This rare material is not a wood species in its own right, but comes from wood that sank into bogs many centuries ago and has undergone various processes of change in the meantime. This preserves the wood naturally and lastingly. An expressive, dark colour develops due to the tannins in the bog. The scarcity of these tree trunks today makes this material a genuine rarity. The colouring of the wood varies between brown, dark brown and black-brown. To begin with, square timbers are sawn from the few usable trunk sections and then turned out as handles. Several polishes with fine oils provide an additional seal for the surfaces and give them a silky-matt finish. At home everywhere, with an open mind for new worlds and experiences: The cosmopolitan is the role model for the development of this modern series with its contemporary, elegant design. Its special appeal is achieved not least by our characterful materials such as horn-coloured or black high-grade resin. For the natural materials we have chosen olive wood in warm shades and bog oak as a darker contrast. Selected sections of wood from trunks up to 3,000 years old are used. Simple, high-quality chrome rims accentuate the beautiful surfaces of the handle materials. 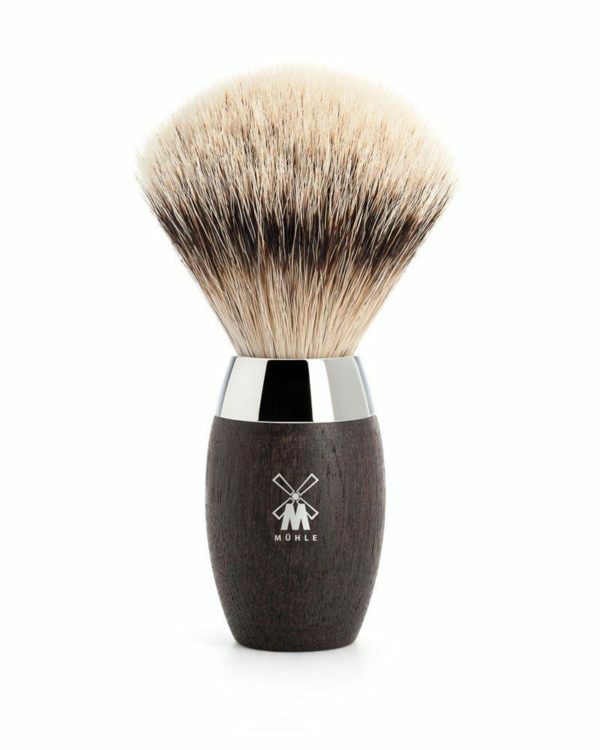 Like many of our series, KOSMO is available in the hair grades silvertip badger, fine badger and vegan ‘Silvertip Fibre’. The brush heads can be unscrewed and replaced with ease.